Sometime in mid November Megan, Weston,and I traveled to my parents' home, located about 120 miles Northeast of where we live in Columbus. The acidic clay soils of eastern Summit County are heaven for red maple and black cherry. That's mostly what you see in this photograph. Each time I visit their house, and take a look at the woods behind their grassy yard, I learn something, even though I spent countless hours there growing up. 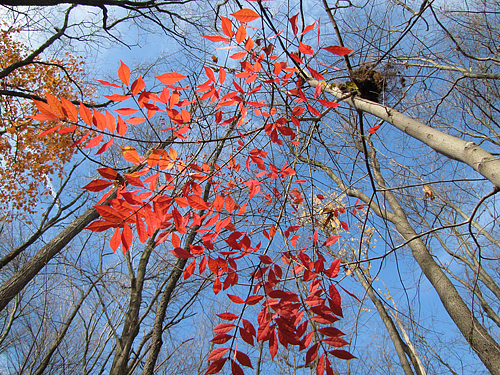 This time I looked out into the woods and saw a small shrub with blazing red leaves. It stood out in contrast to the rest of the woods because all the other leaves had withered and fallen away. This is a burning bush, Euonymus alata, which is an extremely common ornamental shrub. You can find this in most suburban yards throughout Ohio. It is native to Asia, and it would be a fantastic plant if it stayed where it was planted. But it hasn't, and it shows up in natural areas. Birds transport seeds because they eat its bright red fruits. I've never seen this species in huge numbers, but it has escaped enough to be considered by some to be invasive. Recently, on the Ohio invasive plant list serve, there was a lengthy discussion about it. Many people, both in the garden trade and natural areas managers, were unaware that it is showing up in Ohio's woodlands. Although I've never seen it out-competing or dominating woods, I'm beginning to notice it more frequently. I'm finding little shrubs along the Olentangy River that seem to be responding after the non-native bush honeysuckles are removed. I've seen them scattered occasionally throughout the woods of Highbanks Metropark just north of here. And now I found it in my parents backyard as a naturalized plant. So how did it get in the tree? I plucked it out of the ground and hung it there. It's both a way to ensure the plant doesn't root again, and to let others know that something is going on with this plant. I've been know to pull woody invasives wherever I go and leave a trail of dangling shrubs in my wake. Obviously, I can't do this in areas where an invasive species has completely taken over, but when there are a few individuals here or there, I encourage everyone to quickly yank non-natives from natural areas. I don't know if this species will become our next big problem. But I do know I'm now noticing it. Take a look to see if you see it as well in the areas you frequent. Obviously, the bright red autumn leaves make it really stand out, but without leaves its fairly distinctive. Its branches have fairly distinct parallel greenish wings projecting outwards from the wood, hence the scientific name "alatus", which is Latin for "winged". Most likely, it will show up in woods that are not far from suburban areas. And now back to the picture. I think that the perspective on this one is fairly tough. Although the root ball does look like a squirrel's nest high up in a tree, it was merely a few feet of the ground. I'm laying on my back, with Megan's camera (the Canon SX20is, which I'm darn impressed with, but that is another post), at full wide angle, to get this shot. Oh yeah. When we bought our house, it came with a burning bush. I recently lopped off its branches, and I'm waiting for spring to dig the roots out of the ground. Although it was a great winter perch for birds, it had to go. Hopefully next spring, I'll fill the empty spot with a nice native spicebush. What about serviceberries? We tore out all our burning bushes and put in serviceberries, which I find just as pretty, but apparently not invasive? Let's hope, because it was more expensive than just keeping the burning bushes. We do the same with honeysuckle and I think hanging the rootball in a tree serves a third purpose: it warns passing seeds not to take root there! My neighbor has several huge burning bushes that badly need to be cut back. I've thought about lopping off a few branches myself. I find little ones popping up in my gardens and other places...sigh.